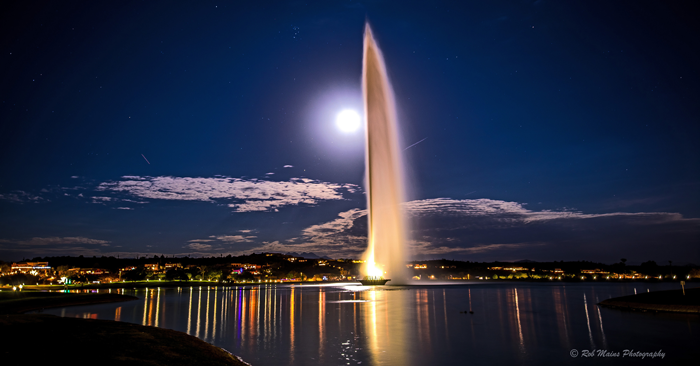 Fountain Lake in Fountain Hills, Arizona, by full moonlight. Photo by Rob Mains. The Town of Fountain Hills, Arizona, U.S., has been awarded International Dark Sky Community status, one of only two International Dark Sky Communities located near major metropolitan areas. It is the seventeenth community to earn this prestigious designation. Long known for its iconic fountain, which at 170 meters (560 feet) was the world’s tallest for decades, its backdrop of the Sonoran Desert mountains, its many great festivals and its mountain preserve, Fountain Hills has adopted a mission to preserve another of its natural assets: its dark sky. A dedicated group of citizens began pursuing the designation nearly three years ago. The resulting formation of the Fountain Hills Dark Sky Association (FHDSA) was triggered by the advent of bright white light-emitting diodes (LEDs). FHDSA Board Member Ted Blank, a NASA Solar System Ambassador and co-founder of the Fountain Hills Astronomy club, agreed that the town’s strategy has worked. “It really is possible to do astronomy here,” Blank said. The local astronomy club, in cooperation with the library, offers monthly star parties to introduce people to planets, constellations, and extraordinary stellar objects. FHDSA Board Members and former mayors, Jerry Miles and Jay Schlum, have noted some residents even have their own domed observatories in their back yard. There’s no doubt many families appreciate the value of dark skies. Looking even further into the future, plans are underway to potentially bring a privately funded public observatory to Fountain Hills. That’s when some serious stargazing will excite kids and adults alike, spark imaginations, teach science, and inspire thoughts about our place in the cosmos. Next post: With Your Support, the International Dark-Sky Association Will be Doing so Much More in 2018!